This week’s lesson on writing skills saw the university’s PE and Dance PGCE students learning several principles of essay writing in an unusual, but in some ways fitting environment. Playing to the strengths of the students’ ability to think about and reflect on physical movement, Drs Alex Channon, Christopher Matthews and Anastasiya Khomutova took the students out of the classroom and into the gymnasium. 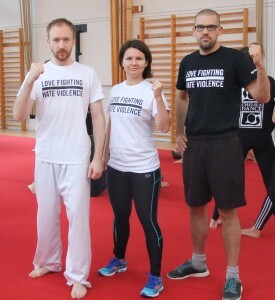 By using three distinct martial arts/combat sports-themed practices to highlight the aforementioned principles, students were taught to think about their academic writing first and foremost as an act of communication. Stressing the importance of writing for a reader, Dr Channon highlighted how essays are essentially written arguments. In this sense, just as a fighter must defeat their opponent by overcoming their resistance, a strong essay will be written in such a way that it can persuade sceptical readers to accept the point the writer wishes to make. The lesson began with a warm up, after which the students were led by Dr Matthews in a short boxing session, learning how to move their opponent around and land successful blows past their opposite number’s guard. In a short ‘foot sparring’ game, the students tested moves and counter-moves, figuring out ways of pre-empting counters and landing against their moving opponents. For several minutes the students worked at developing a feel for the exchange of steps, learning the importance of responding to their partner’s (likely) moves, rather than simply launching their own attacks. Afterwards, reflecting on these principles with respect to writing, the students then scanned several short journal article extracts for moments where the authors seemed to be setting up an argument, either by anticipating readers’ likely criticisms of their points, or otherwise guiding their readers’ attention towards examples that fit their developing case. 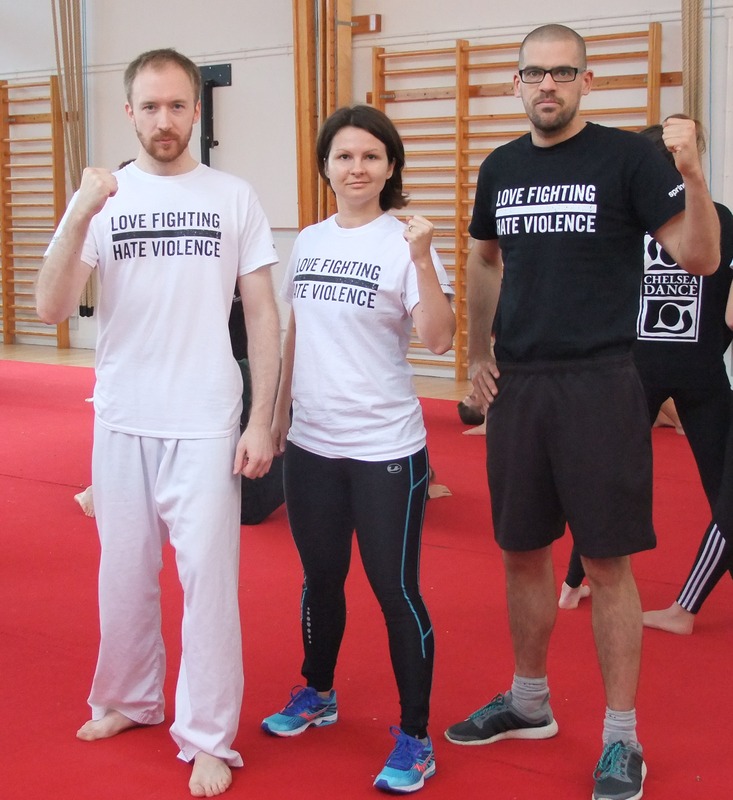 Following this, Dr Channon and Dr Khomutova demonstrated two different takedown moves, showing students how to move a fight from a standing (punching and kicking) exchange to a grappling one. This practice served to highlight the importance of transitioning smoothly between different points in one’s essays. The students rehearsed these techniques, learning how to move their partner with them in a smooth and controlled manner. Returning to writing, the students learned how we often need to make several, related points in order to build and complete an overall argument. By not showing one’s reader how ‘point A’ relates to ‘point B’, we risk leaving our essays feeling disjointed, weakening their persuasive quality. Highlighting the importance of completing a throw by staying in control of one’s opponent, Dr Channon thus argued that good written transitions need to carefully and logically guide readers between different points in one’s text, rather than simply herald a sudden change in topic. Looking again at their journal articles, the students then identified such transitions with the help of the lecturers. The final point focused on the notion of ‘finishing’, addressing the need to reach a clear conclusion and state one’s thesis in a concise and explicit fashion. Flashy fighting moves are no good at all if they cannot help a fighter defeat their opponent; likewise, a neat essay is incomplete without a clear, concluding argument. After a few good-natured (and carefully controlled!) demonstrations of such ‘finishing moves’, the students returned to their journal articles and looked through again for clear statements of the authors’ arguments or positions. The lesson then concluded with a short, reflective discussion of the key learning outcomes, demonstrating that principles of good academic writing are not only applicable to, but also learnable through, different activities. 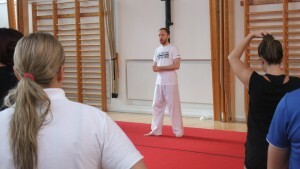 With the session built on using martial arts techniques as a kind of physical metaphor, designed to aid learning through whole-body engagement in a novel and enjoyable practice, the students were left with the possibility of designing similar ways of teaching academic skills that draw on their own specialist activity areas. As young experts and future professionals in physical education and dance pedagogy, there is little doubt that they have the capacity to succeed in doing so. Brilliant lesson. I totally agree regarding “build(ing) and complete(ing) an overall argument” in an essay, the same as if you are writing a decent complaint letter, which I have recently had to do. This article is very interesting, I like the concept of “writing is like fighting”. Thanks guys! Love the idea, and sounds like a great session! 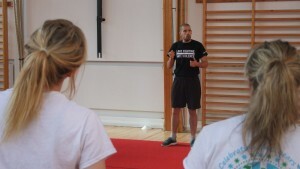 I would have loved to participate, perhaps a similar style seminar for staff in the future?